Whether you need a new boiler installation or are just replacing an old one, we can help. Central heating boilers in domestic homes are generally Combi boilers, Conventional boilers or System Boilers. A combination boiler (also known as a combi boiler) is a single unit that provides both your heating and hot water. Generally wall mounted, they can be located in most locations within a home. Where possible we install them out of the way in lofts, garages and redundant cylinder cupboards. Eliminating the need for water tanks, a combi boiler installation can help free up valuable space in your home. Combi’s work by instantly heating mains fed cold water, providing great hot water pressure. The majority of our customers upgrade their boilers to combi boilers from the older style conventional boilers. Especially, if they have very poor hot water pressure due to a gravity fed system. Also, combi boilers eradicate the need for any shower pumps, helping save money on electricity bills. Combi boilers are suitable in properties up to the size of a small 4-bedroom detached house, depending on the hot water demand. As combi boilers don’t store hot water they can struggle in properties with a high demand for hot water. All combi boilers have a maximum hot water flow rate, usually shown in litres per minute. This indicates how much hot water it is capable of heating at any given time. The hot water flow rate is dependent on your mains flow rate. For example, if the flow rate coming into your property is 10 litres per minute you will only get 10 litres per minutes of hot water, regardless of the boiler’s capacity. Therefore it’s important for an engineer to check the properties flow rate so a suitable boiler can be installed. Generally, replacing a Combi boiler is a straightforward job and takes about one day. Sometimes two if the boiler requires relocating or if there is a lot of pipework that needs tidying up. A Conventional boiler or a (heat only boiler) works in conjunction with a hot water cylinder. Indirectly heating the water through a coil inside the cylinder. The majority of these systems are gravity fed and also have one or two water tanks in the loft. Therefore hot water pressure from this type of installation is often poor unless a shower pump is installed. Most Conventional boilers are old and inefficient. They have a pilot light running 24/7 and waste a lot of energy, leading to high gas bills. Conventional boilers are generally found in kitchens or behind fires commonly known as back boilers. A lot of our customers opt to convert to a Combi boiler to benefit from better hot water pressure and lower energy bills. The job of converting the system can take up to two days and will cause a slight disruption in the home. Pipework requires alteration and floorboards lifted to enable this. Hot and cold water tanks will be disconnected and removed, where possible. Some customers replace their existing conventional boilers with a new more efficient conventional boiler. This affords ease of installation, greater energy efficiency and lowered gas bills, but does little to improve hot water pressure. Conventional boilers can be installed in homes of all sizes, but are generally recommended for houses where converting to a combi boiler would cause a lot of disruption and additional work. A system boiler is very similar to a Conventional boiler. They work indirectly, heating a cylinder through a coil, but in this case, the pump is in the boiler instead of external. Installed with unvented hot water cylinders, they provide substantial hot water pressure to the home. They are suitable for 4+ bedroom homes with high hot water demand. With a conventional boiler, there are multiple parts external to the boiler, like the pump and zone valves if any of these parts stop working the customer has to pay to get them replaced. Whereas with a system boiler all the parts are inside the boiler, meaning everything is covered under the guarantee. A magnetic filter is a small cylindrical unit that fits underneath the boiler. We install them at no additional cost and highly recommend them. The filter stops any sludge from entering your boiler and seizing or blocking moving parts and capillaries. Poor water quality causes up to 90% of boiler issues so it makes sense to protect your boiler from it. Will I need a power flush? Power flushing involves using a high pressured pump to send water throughout the system. Helping to flush out sludge build up. Most properties don’t need a power flush unless the water quality is extremely bad and their heating system has had circulation problems before. Power flushing can also cause problems with gravity fed systems as the pipe work can’t deal with the additional pressure. After most installations we will do a chemical flush. Chemical flushing involves circulating cleaning chemicals round the system using the boilers pump for a few hours. The chemicals are then drained out and replaced with fresh water and inhibitor. This usually can be used to help to improve the water quality in your central heating system and improving the efficiency of your radiators. What boiler brands do we install? We offer installation of all brands of boiler but we generally install select few. As Worcester Approved Installers, we generally advise our customers to buy a Worcester for their home. Worcester boilers are the best on the market when combined with Worcester’s extended warranty (up to 10 years), positive track record and excellent customer service, they make a great package. Worcester boilers do have a price premium and as such, we offer a range of quality brands to suit a range of budgets. We install Vokera and Ideal boilers regularly and they afford great value for money and reliability. 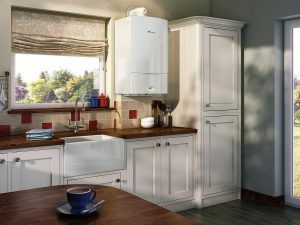 What does a boiler installation cost? A boiler installation can cost anywhere from £1,000 to £3,000 depending on the make and model of the boiler. Will I have running water during the installation process? There may be periods during the installation where the water and gas will be turned off, we keep these periods as short as possible as we recognise the inconvenience they can cause. Also, if the job is expected to take more than one day we will always leave you with running water overnight. We accept all forms of payment except cheque. We will invoice you on completion of the installation and payment terms are seven days. Call or email us anytime to discuss your boiler installation, we are more than happy to help you. Or, fill in the contact form below and a member of the team will be in contact.